Despite having his weapon on aggressively clear display, he was greeted by one of the worshippers - an elderly Afghan man - with the words "Welcome, brother". The main suspect is Australian, and the victims were from a number of different countries including India, Pakistan, Egypt, Jordan and Somalia. So when Prime Minister Jacinda Ardern appeared behind a podium to deliver a statement a few hours after the attack, it wasn't just New Zealand who listened to what she had to say. By so swiftly and decisively describing the shooting as a "terrorist attack", Ms Ardern seemed to show an awareness and consideration of the fact that many people feel officials are reluctant to use this word when an attacker is white, even if that attack is politically motivated. Her acknowledgement of the fear and sorrow of the Muslim community didn't end there, either. 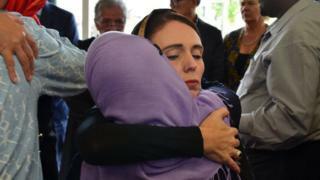 She hugged the victims in Christchurch, wearing a black headscarf as a simple show of respect; she gave people the unifying cry "They are us"; and addressing parliament for the first time a few days later, she made a small but bold statement by opening her remarks with the Islamic greeting "As-Salaam Alaikum". But she's combined this show of empathy with promises of concrete legislative and cultural change. 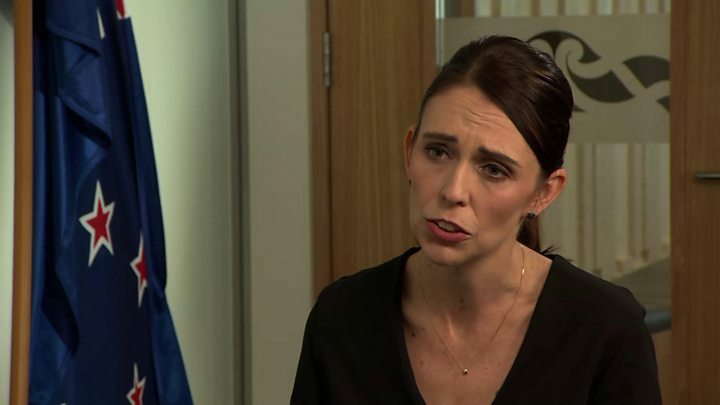 A few hours after the attack, she announced a clampdown on the country's lax gun laws "within 10 days", and speaking to the BBC's Clive Myrie she promised to "weed out" racism both in New Zealand and globally. "We cannot think about this in terms of boundaries," she insisted. Media caption"We cannot think about this in terms of boundaries"
"Martin Luther King said genuine leaders did not search for consensus but moulded it," Suzanne Moore wrote in the British paper The Guardian: "Ardern has moulded a different consensus, demonstrating action, care, unity. Terrorism sees difference and wants to annihilate it. Ardern sees difference and wants to respect it, embrace it and connect with it." The Washington Post's Ishaan Tharoor wrote that "Ardern has become the face of her nation's sorrow and grief, and its resolve". Annabel Crabb wrote on the ABC Australia website that "having been confronted with the worst news a leader can receive... Ms Ardern has yet to put a foot wrong". Grace Back put it simply in Marie Claire Australia: "This is what a leader looks like." The praise didn't just come from commentators. Mohammad Faisal, from Pakistan's Ministry of Foreign Affairs, said that Ms Ardern "has won the hearts of Pakistanis", while the King Center - a memorial to Martin Luther King in the US - tweeted that "there's a leader with love on full display in New Zealand". Closer to home, in New Zealand, BBC News correspondent Hywel Griffith says he has "heard her words - 'we are one, they are us' - spoken back to me by the families of victims here in Christchurch". Even Judith Collins, from the opposition National Party, told parliament that the prime minister had been "outstanding". Colin James, a political analyst in New Zealand, tells BBC News that having spent "quite a bit of time" with Ms Arden, he's not surprised by the praise she's now getting. "She was firm, sombre, positive and in charge," he said. "And this is something I've said often - there's not a nasty cell in her body, but she's not a pushover. It's an unusual combination." When she first started campaigning in 2017, she was regularly compared to Canadian Prime Minister Justin Trudeau and the French President Emmanuel Macron. It made some sense; all three seemed progressive, ambitious, and young - Ms Ardern was 37 when she took office. There was so much hype around her that it was termed "Jacindamania", and led some to worry that she would turn out to be all style and no substance. While the comparisons have continued, they are only to show how exemplary Ms Ardern has become. Sushil Aaron wrote in the New York Times that she "is emerging as the definitive progressive antithesis to the crowded field of right-wing strongmen... whose careers thrive on illiberal, anti-Muslim rhetoric". One clear example of this is her request of President Donald Trump, who asked her what support the US could provide. "Sympathy and love for all Muslim communities," she replied. Another is her simple description of Australian Senator Fraser Anning's comments blaming the attack on immigration: "A disgrace." And the images of a sincere Ms Ardern comforting victims the day after the attack have been contrasted with politically similar leaders, too. Al Jazeera journalist Sana Saeed said she "can't recall Trudeau showing this depth of humanity for the victims of the Quebec mosque massacre" in 2017, adding that former US President Barack Obama didn't visit the victims of the Oak Creek Gurdwara shooting in Wisconsin in 2012 (then-First Lady Michelle Obama went instead). Last year, a widow of a shooting victim even called Mr Trudeau "a piece of" something unpleasant over the phone, because he hadn't paid his condolences in person while he was in the city. "Often people have dismissed her as being attractive and saying the right things," Mr James explains. "But there's much more to her than that - and she's demonstrated that in the last few days to such an extent that far fewer people can hold that view now."